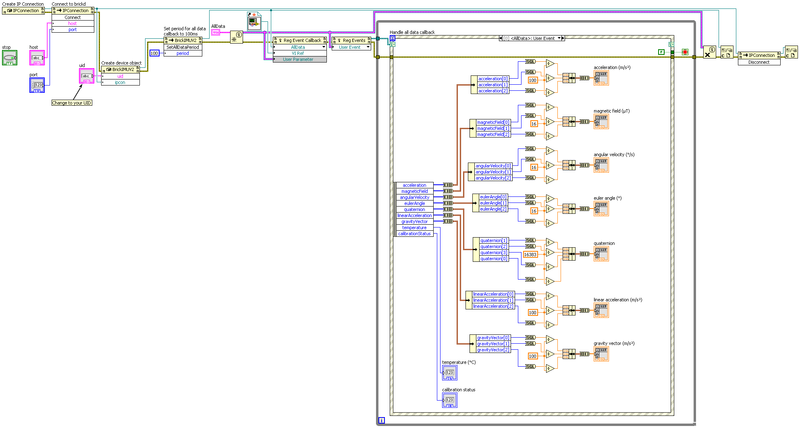 This is the description of the LabVIEW API bindings for the IMU Brick 2.0. General information and technical specifications for the IMU Brick 2.0 are summarized in its hardware description. If you want to get the orientation periodically, it is recommended to use the OrientationCallback callback and set the period with SetOrientationPeriod(). It is also possible to get the gravity vector with the influence of linear acceleration removed, see GetGravityVector(). If you want to get the linear acceleration periodically, it is recommended to use the LinearAccelerationCallback callback and set the period with SetLinearAccelerationPeriod(). It is also possible to get the linear acceleration with the influence of gravity removed, see GetLinearAcceleration(). If you want to get the gravity vector periodically, it is recommended to use the GravityVectorCallback callback and set the period with SetGravityVectorPeriod(). If you want to get the quaternions periodically, it is recommended to use the QuaternionCallback callback and set the period with SetQuaternionPeriod(). If you want to get the data periodically, it is recommended to use the AllDataCallback callback and set the period with SetAllDataPeriod(). If you want to get the acceleration periodically, it is recommended to use the AccelerationCallback callback and set the period with SetAccelerationPeriod(). If you want to get the magnetic field periodically, it is recommended to use the MagneticFieldCallback callback and set the period with SetMagneticFieldPeriod(). If you want to get the angular velocity periodically, it is recommended to use the AngularVelocityCallback acallback nd set the period with SetAngularVelocityPeriod(). If the fusion mode is turned off, the functions GetAcceleration(), GetMagneticField() and GetAngularVelocity() return uncalibrated and uncompensated sensor data. All other sensor data getters return no data. Returns the sensor fusion mode as set by SetSensorFusionMode(). Returns the period as set by SetAccelerationPeriod(). Sets the period in ms with which the MagneticFieldCallback callback is triggered periodically. A value of 0 turns the callback off. Returns the period as set by SetMagneticFieldPeriod(). Sets the period in ms with which the AngularVelocityCallback callback is triggered periodically. A value of 0 turns the callback off. Returns the period as set by SetAngularVelocityPeriod(). Sets the period in ms with which the TemperatureCallback callback is triggered periodically. A value of 0 turns the callback off. Returns the period as set by SetTemperaturePeriod(). Sets the period in ms with which the OrientationCallback callback is triggered periodically. A value of 0 turns the callback off. Returns the period as set by SetOrientationPeriod(). Sets the period in ms with which the LinearAccelerationCallback callback is triggered periodically. A value of 0 turns the callback off. Returns the period as set by SetLinearAccelerationPeriod(). Sets the period in ms with which the GravityVectorCallback callback is triggered periodically. A value of 0 turns the callback off. Returns the period as set by SetGravityVectorPeriod(). Sets the period in ms with which the QuaternionCallback callback is triggered periodically. A value of 0 turns the callback off. Returns the period as set by SetQuaternionPeriod(). This callback is triggered periodically with the period that is set by SetAccelerationPeriod(). The parameters are the acceleration for the x, y and z axis. This callback is triggered periodically with the period that is set by SetMagneticFieldPeriod(). The parameters are the magnetic field for the x, y and z axis. This callback is triggered periodically with the period that is set by SetAngularVelocityPeriod(). The parameters are the angular velocity for the x, y and z axis. This callback is triggered periodically with the period that is set by SetTemperaturePeriod(). The parameter is the temperature. This callback is triggered periodically with the period that is set by SetLinearAccelerationPeriod(). The parameters are the linear acceleration for the x, y and z axis. This callback is triggered periodically with the period that is set by SetGravityVectorPeriod(). The parameters gravity vector for the x, y and z axis. This callback is triggered periodically with the period that is set by SetOrientationPeriod(). The parameters are the orientation (heading (yaw), roll, pitch) of the IMU Brick in Euler angles. See GetOrientation() for details. This callback is triggered periodically with the period that is set by SetQuaternionPeriod(). The parameters are the orientation (x, y, z, w) of the IMU Brick in quaternions. See GetQuaternion() for details. This callback is triggered periodically with the period that is set by SetAllDataPeriod(). The parameters are as for GetAllData().